BACKGROUND AND PURPOSE: Cervical epidural steroid injections are approached with trepidation because of concerns over safety, including direct spinal cord injury. CT fluoroscopy is an alternative to conventional fluoroscopy that could potentially help reduce the risk of injury by providing improved localization of the needle tip. We sought to determine rates of technical success and risk of complications in our initial cohort of patients treated with cervical interlaminar ESI performed under CTF guidance. MATERIALS AND METHODS: In this retrospective case series, we reviewed procedural details and CTF images of 53 consecutive cervical interlaminar ESIs performed on 50 patients over a period of 8 months. Rates of technical success, incidence of complications, procedure times, and factors that influence radiation exposure were examined. RESULTS: No symptomatic procedural complications were observed. A single case of intrathecal contrast injection was observed, from which the patient was asymptomatic. The remaining injections were all technically successful. Injections were performed at every cervical level, as high as C1-C2. Total procedure times averaged less than 20 minutes. Average CT fluoroscopic time was 24 seconds and median tube current was 70 mA. CONCLUSIONS: CTF-guided cervical interlaminar ESI can be performed at all levels in the cervical spine with a low rate of procedural complications. Short total procedure times, CT-fluoroscopy times, and reduced tube current make this procedure a practical alternative to cervical ESI performed under conventional fluoroscopy. Cervical epidural steroid injections are commonly used to treat spinal pain and radiculopathy. Observational and randomized trials have demonstrated the benefit of such injections for the management of chronic pain.1,2 Concerns have developed over the safety of this procedure, however, with reports of serious complications in the literature.3⇓–5 Some authors have suggested that the interlaminar approach for performing injections may be associated with a lower risk of catastrophic injury than the transforaminal approach, though spinal cord injury remains a possibility with either approach.6⇓⇓–9 As such, many authors advocate limiting interlaminar epidural steroid injections to the C6-C7 level or below to reduce the risk of cord injury.4,10,11 This restriction may necessarily limit the ability to deliver the greatest concentration of steroid to the site of pathology when it is above the C6-C7 level. 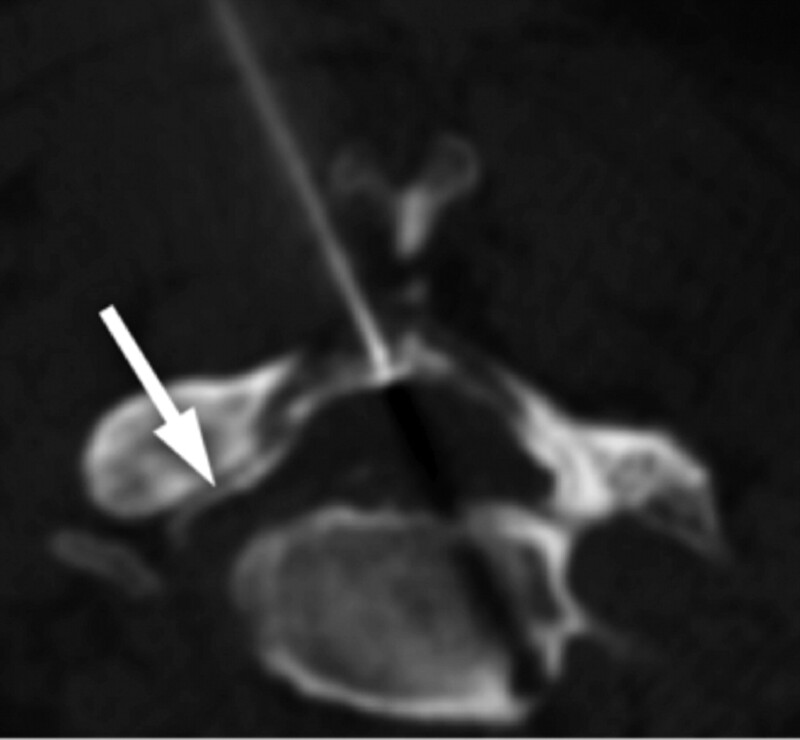 CT fluoroscopy offers an alternative method for performing cervical interlaminar steroid injections that could help to reduce the risk of injury by allowing direct visualization of the location of the needle tip with cross-sectional imaging. However, the technique for CTF-guided cervical interlaminar ESI has only recently been reported,12 and there are no case series describing the safety of this technique. Furthermore, some authors have dismissed the use of CT guidance for cervical interlaminar epidural injections, citing difficulty with access and patient positioning.13 Others consider the routine use of CT guidance to be impractical, due to the perception of lengthy procedure times and excessive radiation exposure. The purpose of this investigation was to examine rates of technical success and risk of procedural complications in our initial cohort of patients who underwent cervical interlaminar steroid injections under CTF guidance. Secondary aims were to assess the practical utility of the procedure by examining procedure times and factors that influence radiation dose, and to examine patterns of injectate spread in the epidural space. This investigation is a retrospective case series of all patients who underwent cervical interlaminar steroid injections under CTF guidance at our institution between June 1, 2010, and February 2, 2011. Patients were referred for the treatment of neck pain and/or upper extremity radicular symptoms. A total of 53 injections on 50 patients were identified. The average patient age was 53 years, with a range of 30–75 years. There were 23 male and 27 female patients. The procedures were performed by 4 fellowship-trained neuroradiologists with 3–9 years of prior experience in performing spinal injections under CTF guidance, including transforaminal epidural injections. All proceduralists had less than 6 months' experience in performing cervical interlaminar epidural injections using CTF. The decision to perform a steroid injection using an interlaminar approach (versus a transforaminal approach) was at the discretion of the treating neuroradiologist. Although this decision was not made with a strict predefined algorithm, in general, interlaminar injections were selected for patients with radicular pain referable to multiple dermatomal distributions, nonradicular neck pain, and in patients whose symptoms were felt to be referable to central disk pathology without a significant foraminal component on imaging. All patients who underwent an interlaminar steroid injection were included. No patients were excluded. The investigation was approved by our local institutional review board. Prior imaging and clinical history were reviewed to determine the level of pathology to be targeted by the steroid injection. The patient was placed in the prone position on the table of a CT scanner (LightSpeed 16; GE Healthcare, Milwaukee, Wisconsin) equipped with intermittent mode CT-fluoroscopic capability, CTF hand controls, and a foot pedal. A skin marker was placed on the midline neck, and axial images limited to the level to be injected were obtained for planning purposes. The level of interest was marked on the skin, and the area was prepped and draped using standard sterile technique. Local anesthesia was obtained with lidocaine 2% (Hospira, Lake Forest, Illinois) buffered with sodium bicarbonate 8.4% (Hospira) in a 9:1 dilution. 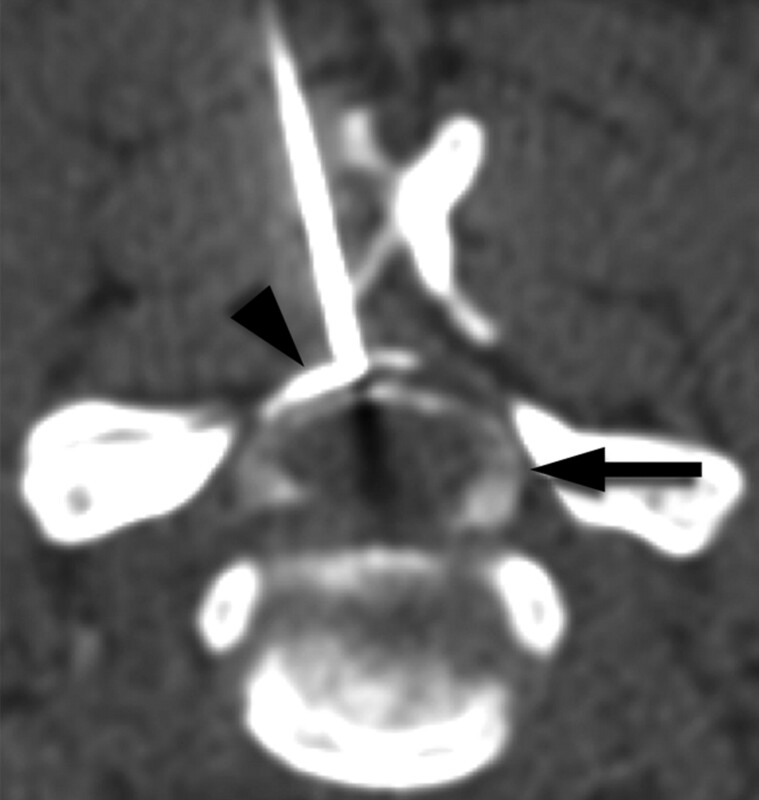 A 22-ga Quincke (BD Medical, Franklin Lakes, New Jersey) point spinal needle was advanced under CT-fluoroscopic guidance using a posterior oblique approach (to avoid the midline spinous process) to the posterior margin of the ligamentum flavum. The side of the approach (ie, right or left oblique approach) was selected to match the side on which the patient was most symptomatic. A small amount of dilute contrast (Isovue M-200 [Bracco Diagnostics, Princeton, New Jersey] diluted 1:1 with preservative-free sterile saline) was injected. If the needle tip were superficial to the ligament, contrast would outline the dorsal aspect of the ligamentum flavum. The needle was then advanced in short increments into the epidural space, with frequent test injections of dilute contrast until contrast was seen spreading in the epidural space ventral to the ligamentum flavum (Fig 1). The images were evaluated for contrast opacification of vascular structures that would indicate intravascular placement of the needle tip. Once contrast was seen in the epidural space, a second spot image delayed by approximately 3–4 seconds was obtained to assess for washout of contrast that might similarly indicate intravascular placement. The steroid preparation was then injected. The authors used 2 mL Celestone Soluspan (6 mg/mL; Schering-Plough, Kenilworth, New Jersey). The needle was then removed and the patient was observed for 10–20 minutes to evaluate for immediate complications. Before discharge, patients were provided with contact information and instructions to immediately notify the radiologist who performed the procedure of any complications. CTF-guided cervical ESI. Image from planning CT (A) demonstrates the normal appearance of the ligamentum flavum (arrow). The needle is advanced under CT-fluoroscopic guidance to the ligamentum flavum (B) and then carefully advanced in short increments until contrast fills the epidural space (C). The incidence of complications was assessed in 2 ways. First, procedure reports were reviewed for evidence of symptomatic complications that occurred during or immediately after the procedure. Second, images obtained during the procedure were reviewed for evidence of penetration of the thecal sac, intravascular injection, or unintended placement of the needle into the spinal cord or other critical neurovascular structures. Penetration of the needle into the thecal sac was judged by the presence of contrast layering dependently within the thecal sac or filling the subarachnoid space at any time during the procedure. Intravascular injection was judged by the presence of any of the following criteria: contrast opacification of a vessel seen on any CT fluoroscopic image; washout of contrast on the delayed spot fluoroscopic image; or if the proceduralist was able to inject contrast without resistance, but no contrast was seen at the needle tip on the fluoroscopic images and no leak from the tubing was detected. Technical success was determined by reviewing the CTF images for the presence of epidural contrast. Patterns of contrast spread within the epidural space were also characterized on the CTF images. If contrast remained in the epidural space ipsilateral to needle placement, spread was considered to be unilateral. If contrast spread past the midline in the dorsal epidural space, it was considered to be bilateral. The proximity of the contrast spread toward the neural foramen ipsilateral to the side of the injection was also examined; spread to the medial margin of the neural foramen, as well as spread into the neural foramen proper from the epidural space, were recorded. Procedural details were collected, including the level of the injection in the cervical spine, the tube current selected by the operator, the number of seconds of CT-fluoroscopic time used, and the total procedural time. Procedure time was calculated as the time between the electronic time stamps on the initial scout image and the final fluoroscopic image. In the 53 cervical interlaminar steroid injections reviewed, there were no immediate symptomatic complications. A single case of thecal sac penetration was identified in which there was simultaneous contrast opacification of the epidural space and the subarachnoid space (Fig 2). This occurred during an injection at the C5-C6 level. The patient was asymptomatic, and the needle did not approach or contact the spinal cord. No intravascular injections were identified. CTF image obtained during interlaminar needle placement that demonstrates inadvertent intrathecal contrast injection. Dense contrast is seen in the epidural space (arrowhead), and more dilute contrast is seen in the thecal sac (arrow). This complication was recognized before steroid injection. The patient was asymptomatic. All the remaining cases were technically successful. Injections were performed at every cervical level, from C1-C2 to C7-T1. The most common level injected was C5-C6. Bilateral contrast spread in the epidural space was seen in 83% of cases. Spread of contrast to the medial margin of the ipsilateral neural foramen was identified in 94% of cases. Spread into the ipsilateral neural foramen itself was identified in 49% of cases. The median mA selected by the proceduralist was 70 mA, with a range of 30–150 mA. The average CT-fluoroscopic time was 24 seconds, with a range of 3–77 seconds. Average procedure time was 19 minutes, 13 seconds. Cervical spine interlaminar epidural injections are approached with trepidation because of reports of rare, but devastating, complications. Our investigation demonstrates the feasibility of performing interlaminar cervical epidural injections using CT fluoroscopy with a low rate of procedural complications. In this pilot study involving 53 procedures, no symptomatic procedural complications were observed. The only observed complication was a single case of combined epidural and intrathecal contrast, from which the patient was asymptomatic. This case highlights the potential value of CT fluoroscopy, as the intrathecal portion of injected contrast was small compared with the epidural component and could have been missed on conventional fluoroscopy. Technically successful injections were performed at every cervical level in our series, as high as C1-C2. Many authors advocate performing cervical interlaminar steroid injections only at the C7-T1 level or below.4,11,14 This is due to several anatomic factors that make injections in the upper cervical spine more challenging. First, there is a progressive decrease in the anteroposterior size of the epidural space in the more cephalad cervical spinal canal, which provides less room for error when advancing a needle into the epidural space.15 Second, there are often midline gaps in the ligamentum flavum, and the interspinous ligament may be attenuated or absent, factors which may make the loss of resistance technique unreliable in some patients.15,16 In 1 investigation of cervical interlaminar steroid injections performed using conventional fluoroscopy, a 53% rate of false loss of resistance was found on the first attempt to enter the epidural space.17 Together, these anatomic challenges can result in improper depth of needle insertion during attempts to access the epidural space, with the potential for catastrophic consequences.18 The ability to directly visualize the ligamentum flavum, subarachnoid space, and spinal cord with CTF helps to overcome these limitations by allowing more precise evaluation of the depth of the needle placement, thereby allowing the proceduralist to deliver medication as close as possible to the site of suspected pathology. There are few available data informing the decision of when to select an interlaminar approach versus a transforaminal approach for epidural steroid injections. In addition to weighing safety concerns, understanding the distribution of injectate within the epidural space may help the proceduralist decide when to select interlaminar or transforaminal approach for cervical ESI. One scenario in which the interlaminar approach for steroid injections may be selected is in patients with bilateral pain symptoms, where bilateral spread of injectate would be desirable. Reported rates for bilateral contrast spread in interlaminar injections performed under conventional fluoroscopy vary widely, however. One investigation found rates of bilateral contrast spread to be as low as 51%, while another investigation found 100% bilateral spread.17,19 In our investigation, we observed bilateral spread of contrast in 83% of cases, supporting the utility of interlaminar injections in patients with bilateral symptoms. For patients with unilateral radiculopathy, some authors have favored the use of the transforaminal approach because of its ability to deliver medication directly into the neural foramen.5 However, we observed spread of contrast into the neural foramen in 49% of cases (Fig 3), suggesting that the interlaminar approach may be effective for treating unilateral foraminal disease in some cases when a transforaminal approach is not possible or desired. Furthermore, the rates we observed for bilateral epidural and foraminal contrast spread probably underestimate the true capacity for injectate to spread in the epidural space for several reasons: the volume of contrast injected was small and not standardized; contrast spread was evaluated only at the axial level of the needle placement; and contrast volume would typically be much smaller than the volume of steroid injected, resulting in underestimation of extent of spread. CTF image obtained during interlaminar injection demonstrates spread of contrast in the epidural space bilaterally, as well as into the ipsilateral neural foramen (arrow). Critics of CT-guided procedures cite radiation dose and lengthy procedure times as drawbacks of this method. However, the use of “quick check” intermittent CT fluoroscopy and decreased tube current have been shown to reduce radiation doses to acceptably low levels for both patient and radiologist.20,21 A recent study comparing conventional fluoroscopy with CTF for lumbar interlaminar epidural injections found the radiation dose for CTF guidance to be half that of conventional fluoroscopy, due to CT-fluoroscopic times that were almost 8 times shorter.22 In our series, the average CT-fluoroscopic time was relatively short at 24 seconds, with some fluoroscopic times as low as 3 seconds. It is possible that increased experience and operator comfort with the procedure will allow progressive reductions in both fluoroscopic times and tube current. Together with an average actual procedure time of less than 20 minutes, techniques to reduce radiation exposure make CTF a practical alternative to conventional fluoroscopy for routine clinical use when performing cervical interlaminar steroid injections. Our investigation has several limitations. Perhaps the most significant limitation is the small sample size investigated. Although the nature of pilot data implies smaller numbers of patients initially, it is possible that the incidence of rare complications would be underestimated by our initial investigation. Further investigation of this technique with greater patient numbers is warranted. An additional limitation is that delayed complications occurring after the patient is discharged and not reported to the proceduralist could be missed in a retrospective investigation. Finally, this retrospective investigation does not directly address clinical outcomes, though we would expect that technically successful interlaminar epidural injections performed under conventional fluoroscopy and CTF would produce similar clinical results. Our investigation suggests that CTF-guided cervical interlaminar epidural steroid injections can be performed at all levels in the cervical spine, with a low rate of procedural complications. Short total procedure times, CT fluoroscopy times, and reduced tube current make this procedure a practical alternative to cervical ESI performed under conventional fluoroscopy. Further experience with greater patient numbers is needed to confirm the safety profile of this technique. Disclosures: Ramsey Kilani—UNRELATED: Stock/Stock Options: FrontRad Technologies, Comments: I am the Senior Medical Advisor and a shareholder in the company. The company provides connectivity solutions, archiving, and consulting services to clinical and research organizations and corporations in the medical imaging field.